Creativity and empowerment through photography. In addition to combating the more serious issues in the Sacred Valley, the Andean Alliance for Sustainable Development also teaches art classes in the village of Pampacorral, Peru. Resting above 13,000 feet above sea level, the mountainside village consists of around 100 students, most of whom have never been exposed to technology. Started in the summer of 2011 by Eric Ebner, Brian Lucke, and Ryan Widemon, the project now teaches over 40 children ranging in ages from 10-18. Funds were raised to purchase digital cameras for the students, who were then taught the medium of digital photography. The three goals of the project are to improve visual literacy, give the children an outlet for creativity, and to have fun. At the end of the summer, each child received a booklet with the best pictures from his/her specific group and the class itself. The school of Pampacorral was given 20 large prints that now hang in the library, in addition, the cameras were left with the school for the students to use. Classes were continued by Eric Ebner and Benedicte Gyllensten from the Monterey Institute of International Studies. Eric and Ben taught in Pampacorral with more cameras, more equipment and more assignments for the students. The AASD is now using some of the students’ photos as promotional material. The Andean Alliance for Sustainable Development also produced a 2012 Promotional Calendar. With help of the Monterey Institute for International Studies, The AASD is now raising funds for exhibitions with the United States and Norway. If anyone knows of gallery openings or would like to help, please contact the Andean Alliance for Sustainable Development. Brian Lucke, Ryan Widemon, Eric Ebner, taught a class in digital photography to the secondary school in Pampacorral. Ranging from ages 13-17, the children were instructed on the use of the cameras and the basic fundamentals of the photography medium. Throughout several months, Brian, Ryan, and Eric raised money through universities and their hometown of Marshall, Michigan. They raised enough money and donations to purchase 8 digital cameras, 8 memory cards, and the money necessary for printing all of the children’s projects. The goal for this project is to provide an outlet for the children to express themselves, while giving them a new perspective on how they view their world. Throughout the six-week period, the class will be working towards fostering the ability to express their own hopes and desires, for themselves and their community. Although some of the children have been the subjects of photos, most (if not all) have never been behind the lens creating their own images. We want to see what is important in their lives and what they see as important in their future. At the end of the class the students will work together to display their photos in large proportions on the side of their community buildings for everyone to enjoy. The children are thrilled with the opportunity to be able to use the cameras, and they have taken to the assignments quite well. The first several days were dedicated solely to the manipulation of the cameras, as most students had never held a camera before. It was a steep learning curve at first, as there were many lessons that we usually take for granted. We overlooked little things like holding the camera at a flat angle, or getting the entire subject in the frame. Being so saturated with cameras in our daily lives, this class has been a learning experience for us as well. Every week we teach another couple of concepts and assign more homework as their understanding of the medium grows. During the course, the students are split into groups of 2 and 3. They alternate possession of the cameras daily, while the groups still work together on the assigned homework. Every weekend, the camera is given to one individual of every group. This project will take three weeks to complete, as every child needs a weekend with the camera. During these three days they will have a separate homework assignment: family portraiture. The students are asked to document their own personal lives and the people and things that affect it. We encourage the students to take pictures of everything that makes up their daily life, through their own eyes. 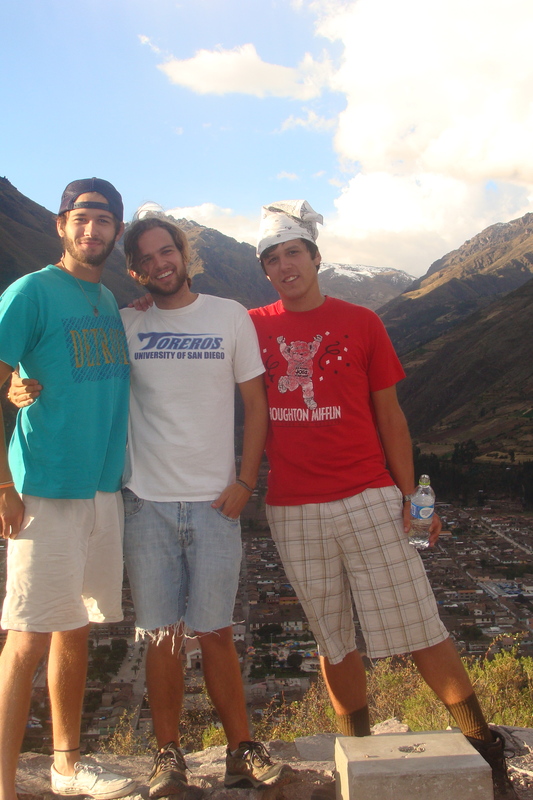 Ranging from the family ceremonies and traditions to the wild animals of the Sacred Valley. This assignment has easily been the most rewarding part of the class. We have been blown away by the incredibly rare moments that they are able to capture. The insight into their lives becomes clearer and more intriguing every day. Every class the photos get better, the students get more involved, and we all become closer as a class. We cannot wait to see what the next couple of weeks hold for our students, as the final project of the large-scale photos is approaching. We are blessed to be able to share this experience with the kids, as we have learned just as much as they have, albeit very different lessons. View a sample of the photos that the students have taken! One incredible day, 30 students, 30 photos – and surely a day of at least 30 big smiles! 30 students from the Sacred Valley traveled to Cuzco to post a photo mural of their photographs. The field-trip to the magical city of Cuzco was a success. The kids got take part in the creation of a foto-mural and to share their hard work with tourist and Cuzqueños alike. They even brought their typical outfits down to the city, but were too shy to put them on. They got to enjoy some new meals, a tour of some ancient sites and to see the the awe and wonder in the eyes of all the passersby that got to view their beautiful work. A group of volunteers from Cuzco helped at the event and worked hard to make this event a success and as enjoyable to the kids as possible. So on March 21st, 2015 – we took take 30 students to the city of Cuzco to post a large photo mural right in the Historic Center in the main Plaza de Armas. We provided this opportunity for the students because we believe in their creativity and the empowerment it triggers. The photo mural project enables the students to have a fun experience and to tell their story. Our goal is to provide the students with an epic experience to share their talent and their story. We believe that the impact is truly immeasurable – it is empowering and encouraging. If the main impact that results from this day is that the students have a fun time, then we will have achieved our aim. We do believe that their photos will result in a beautiful mural that can be enjoyed by all!